Dr. A. R. Sihag Hon. Secretary, Department of Heavy Industries inaugurated SIAT-2019. Dr. A.R. Sihag, Hon. Secretary Department of Heavy Industries inaugurated SIAT (Symposium on International Automotive Technology) -2019, organised by ARAI on 16th.- Jan- 2019 at Oxford Gold Resort, Bavdhan, Pune. In his inaugural speech Dr. Sihag said, that the Government of India has consistently supported cheaper and greener mobility option under FAME (Faster Adoption and Manufacturing of (Hybrid & Electric vehicles), India Scheme and under which testing facilities for Electric Vehicles's (EV's) are being set up in all NATRiP centers including ARAI. The second phase of FAME is planned to further boost this movement. Smt. Neeti Sarkar, CEO-NATRiP, Rashmi Urdhwareshe, Director-ARAI, Vikaram Kirloskar Prsident- ARAI, CV Raman, Vice-President - ARAI, Bala Bhardwaj, President- SAE India, Dr. David Schutt, CEO-SAE-International and A A Badusha, Convener of the symposium, were present on the occasion. Hon. Union Minister of HI&PE inaugurates 3rd. Catalyst Conference, organised by ICAT at Bengaluru 21st.- Sept.-2018. Union Minister for Heavy Industries and Public Enterprises Shri Anant G. Geete has inaugurated the 3rd. Catalyst Conference on 21st.-September-2018 in Bengaluru. 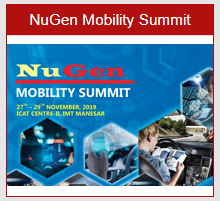 The Catalyst Conference on growth in E-Vehicle industry is a premier annual event organised by ICAT in association with Altius Auto Solutions Pvt. Ltd. This time it has been dovetailed with a three days 'EV Expo South 2018' particularly designed to capture the intrest of EV industry in Southern India. Launching of First Certificate Course on Automotive Telematics and GPS at NIAIMT- Silchar. NIAIMT-Silchar under NATRiP and Indian Auto Company (IAC) with SIAM as the knowledge partner jointly launched the first certificate course on "Automotive Telematics and GPS" at NIAIMT-Silchar ia a event organised on 11th-September-2018. The course will open up fresh opportunity for the youth of North-East region of the country in the field of GPS and Vehicle Tracking System, a rapidly emerging field in Vehicle Safety. Chief-Guest Ms. Neeti Sarkar (CEO&PD, NATRiP) chaired the event through video conference along with Shri P.K. Banerjee )ED-Technical, SIAM) and Shri Saurav Arora (Director, IAC). Shri Y.K. Bansod (GM-BSNL), Shri M.L. Garg (DIG(Sector), BSF), Shri D. Chakraborty (Deputy Commissioner Transport), Ms. Meenakshi Kukreja (Deputy Director, SIAM), Dr. Abhijit Kumar Mandal (Deputy Director, NIAIMT) and Shri Anubrata Chaudhury (Sr. Manager, IAC) were other dignitaries present on this graceful occasion. Click Here for News Detail. Hon. Union Minister of HI&PE Shri Anant G. Geete Inaugurated various test facilities at iCAT. Union Cabinet Minister of Heavy Industries &Public Enterprise (HI&PE) Shri Anant Geete inaugurated the augmented facilities at NATRiP at the International Center for Automotive Technology (iCAT)- Manesar. These augmented facilities are Noise, Vibration & Harshness Lab (NVH), Passive Safety Lab (PSL), Electromagnetic Compatibility (EMC) Lab and Tyer Test Lab (TTL).On the graceful occasion Shri Vishwajit Sahay JS- Department of Heavy Industries, Shri Abhay Damle JS- MORTH, Smt. 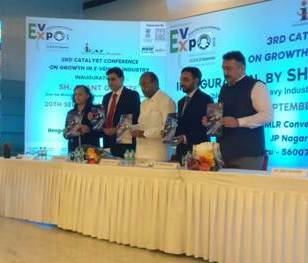 Neeti Sarkar CEO&PD- NATRiP, Shri Kenichi Ayukawa MD& CEO Maruti Suzuki India Ltd., Shri Dinesh Tyagi Director iCAT and other dignitaries from industry, institution and academia were also present. 1st.Stakeholder meeting was held at NIAIMT- Silchar on 1st.-May-2018, to explore the possibilities of effective and optimal use of NIAIMT facilities in area of automotive safety and skill development in northeast region of country. The meeting was Chaired by Ms. Neeti Sarkar (CEO&PD Addl. Charge) NATRiP in the presence of Dr. Lakshmanan S (IAS) Deputy Commissioner, Cachar Dist., Sh. B. D. Das (DIGP) CRPF Group Center, Dayapur-Silchar, Sh. K.N. Sujal (DIG- Prov.) BSF, Sh. Yogendar Kr. Poonia (DC/IMT) BSF- Silchar, Sh. Shankardeb Dhakar (Addl. S.P.) Megahlaya Police, Sh. Madhu Ram Kalita (Principal) Extension Center, State Institute of Panchayat & Rural Development, Hailakandi-Assam, Sh. Pankaj Chowdhary (Z-I/C) CRPF and Sh. Devendra Saxena (Deputy Commandant) CRPF.